international terrorist group, Islamic State in Syria. 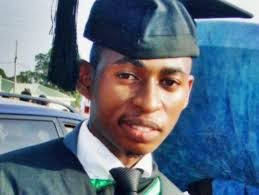 Nazir a graduate of the Kwame Nkrumah University of Science and Technology (KNUST) with a degree in Geography and Rural Development, allegedly left Ghana withing past few weeks to join the terror group.Nazir's father, Kabiru Alema, said soon after completing his mandatory National Service in Ghana on August 2nd, Nazir sent a WhatsApp message to him saying that he was on his way to another region in Ghana on a job-related assignment. Hours later, Nazir sent another one with a different content. Nazir's father says his son and other young men who are believed to have joined the terror group were part of an Islamic group on Whatsapp named “Sadaqa Train,” where they are brainwashed and all of them had extreme ideas of Islam. He says his son's friends that were also on the chat group are no where to be found now. He also added that some disturbing videos have been spotted on his son’s laptop, a clear indicator that Nazir has been sufficiently brainwashed online.